Any parent knows that kids have a bunch of stuff. It seems that even a quick night away requires bags and bags of stuff. From the. Necessities to toys, parents have to be prepared for any and every situation. 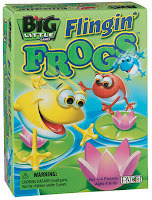 Flingin' Frogs has children attempt to get their frogs on a lily pad. The three tiered levels offer lots of space to launch these jumping jumping frogs. The key to the game is to land your frogs without getting knocked off by your opponent. The first to successfully land all the frogs wins. For parents, the best part about this game is that the playing surface is also the game storage container. Convenience at its best. Spurtle Turtle is the quick action game that has coins spurted out of the turtle's shell. Find the matching sea life tokens and win. This game is a great way to introduce kids to various forms of sea creatures. Plus, what kid doesn't like to see tokens fly. 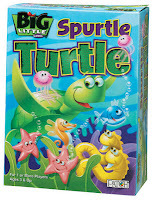 Like other Big Little Games, the turtle is the storage and carrying case. 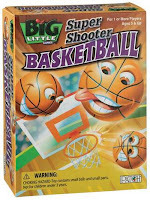 Super Shooter Basketball has the thrill of a real basketball game, just in a smaller size. Players test their shooting skills in three different games. Who will be the slam dunk winner? Practice and patience are key to winning this game. All three games in the Big Little Games line retail for approximately $8.99. The games are intended for ages 4 and up. If you are looking for a great stocking stuffer, vacation game or a item to keep in your carry all bag for periods of down time, check out the line of Big Little Games. Don't let the size fool you. These games pack a big punch! Disclosure: I received these toys to review. All opinions are my own.